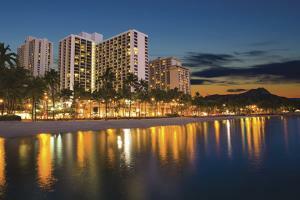 In Waikiki, 25 minutes from the Honolulu Airport. Walk to Honolulu Zoo, Waikiki Aquarium, International Market Place. Across the street from Waikiki Beach. Kuhio Beach Grill, Moana Terrace, Arancino di Mare, D.K. Steakhouse, Sansei Seafood Restaurant and Sushi Bar, Seattle's Best Coffee (2 locations), In-Room Dining.